Celebrate the New Year in London! Where will you be for New Year’s Eve 2016? Make it a celebration to remember in one of the world’s best places to be when Big Ben strikes midnight— New Year’s Eve in LONDON! The firework display in London is an experience like no other. When the clock strikes, the night sky is set ablaze with a pyrotechnic display from the river on London’s South Bank. On New Year’s Eve, you’ll experience a truly unique setting with themed gardens six floors above Kensington High Street. Our venue is Sir Richard Branson’s ‘Roof Gardens.’ The Gardens, divided into 3 themed gardens, feature flamingos, ducks, and over 100 species of trees. Ring in the New Year with a private firework display; then dance the night away at a nightclub featuring some of London’s hottest DJs. If you visit London during this festive time, you’ll truly be celebrating the New Year in style. The city has been called a ‘world in one city’ with a melting pot of cultures and royal pomp and pageantry. Tales of Dickens come to life and all of her halls are decked out for your viewing pleasure. Watch the New Year’s Day parade with the Queen’s horses, colorful floats and marching bands. Don your best winter attire and join us for afternoon tea. Leisure time in London may find you at Hyde Park’s Christmas Market, or Harrods, to enjoy some post-holiday Christmas shopping. Consider visiting the British Museum, the National Gallery or the London Dungeons. Afterward take in the best views of London – from the London Eye before saying farewell to our newfound friends. The London Eye is one of the world’s most famous attractions. Experience Europe’s tallest Ferris wheel, and view London from its highest public observation point. Book and pay $500 deposit by 10/31/16 and save $50! Use Promo code: XLO1650 when booking online. Click Here to Book Your New Year’s Eve in London! AESU offers several trips to London and the UK, including Cosmopolitan, Euro Spree, Explorer, Euro Focus, and our most popular tour, Great Escape. Explore England and its rich history and culture. 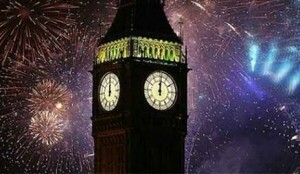 Book Your New Year’s Even in London! This entry was posted on Wednesday, October 19th, 2016	at 12:57 pm	. You can follow any responses to this entry through the RSS 2.0	feed. Both comments and pings are currently closed.